Allen Bradley POINT I/O 4 Point Digital Input Module 1734-IA4 Cat. No. 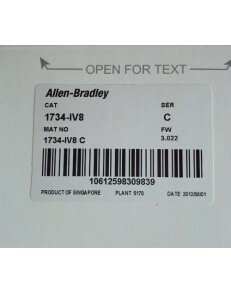 : ..
Allen Bradley POINT I/O 2 Point Digital Input Module 1734-IB2 Cat. No. : 1734-..
Allen Bradley POINT I/O 4 Point Digital Input Module 1734-IB4 Cat. No. : 1734-..
Allen Bradley POINT I/O 4 Point Digital Input Module 1734-IB4D Cat. No. : 1734..
Allen Bradley POINT I/O 8 Point Digital Input Module 1734-IB8 Cat. No. : 1734-..
Allen Bradley POINT I/O 8 Point Safety Input Module 1734-IB8S Cat. No. : 1734-..
Allen Bradley Point IO Safety Analog Input Module 1734-IE4S Cat. No. 1734-IE4..
Allen Bradley POINT I/O 8 Point Analog Input Module 1734-IE8C Cat. No. ..
Allen Bradley POINT I/O 2 Point Digital Input Module 1734-IM2 Cat. No. : 1734-..
Allen Bradley POINT I/O 4 Point Digital Input Module 1734-IM4 Cat. No. : 1734-..
Allen Bradley POINT I/O 2 Point Digital Input Module 1734-IV2 Cat. No. : ..
Allen Bradley POINT I/O 4 Point Digital Input Module 1734-IV4 Cat. No. : 1734-..
Allen Bradley POINT I/O 8 Point Digital Input Module 1734-IV8 Cat. No. : 1734-..
Allen Bradley POINT I/O 2 Point Digital Output Module 1734-OA2 Cat. No. : ..
Allen Bradley POINT I/O 4 Point Digital Output Module 1734-OA4 Cat. No. : 1734..